Lava has launched QPAD R704 Tablet with voice calling support. This Tablet cost Rs. 8,499. This tablet has been built with due consideration of Young working Professional, students in colleges and schools. It has been priced so well that it become easy to bear the cost. Lava QPAD R704 tablet is successor of QPAD e704 which was launched in April. It has a single sim slot and can be used for Voice calling. It runs on Android Jelly Bean v4.3 and can be upgraded to Android Kitkat v4.4. No official has reported for its update. It has got a screen size of 7-inch with IPS LCD display with a screen resolution of 1024 * 600 pixels. 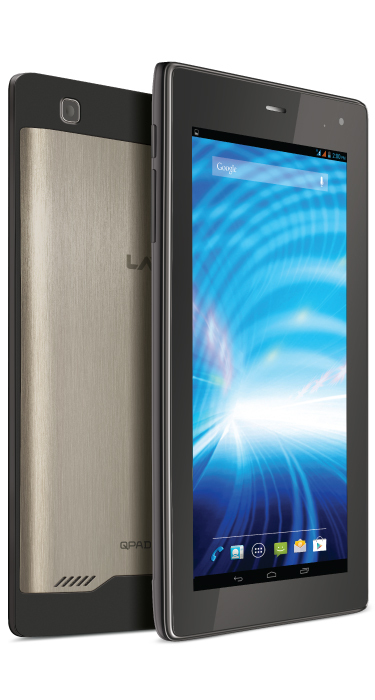 It has been powered with 1.2 GHz Qualcomm Snapdragon Quad-core processor and coupled with 1 GB of RAM. It has inbuilt storage of 8 GB which can be expanded through microSD card upto 32 GB. It has sporting primary camera of 2 MP with Auto-focus and secondary camera of 0.3 MP. It has got proximity and Ambient Light sensor. For its charging this Tablet supports Qualcomm quick charge technology which can charge the battery upto 30 percent faster than the other tablets. On the connectivity it has inbuilt Wi-Fi support, Bluetooth for sharing data and files, 3G support, GPS for navigation on your way to new place. The battery is non-removable and is of 3500 mAh which supports standby of 300 hours and 10 hours of talktime. The Successor of it was very successful and with it company has developed new tablet keeping view of the customer. Lava has been manufacturing Tablets of low range. But, the Premium budgeted tablets are more successful. Now, Company has to enter into manufacturing of premium tablets in order to increase their profit and share.